Again this year, in an effort to reduce costs, we will not be providing you with the traditional packet, but have provided you with the links below for the materials contained in the packets, including the brochures and Resource Guide which contains Preaching for Life ideas and Intercessions. If you choose to purchase a packet or parts of the packet, click here. I have highlighted direct links to many items below. Some resources will continue to be added, so you may want to look at the main page for other resources that will be helpful to you. A Reflection of the development of the poster can be found here. Each article is available in a variety of formats! article by the same name. 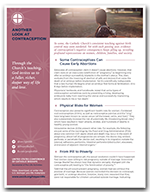 contraception’s negative effect on women’s health. 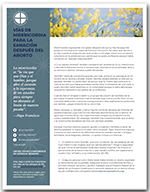 of God’s mercy for people suffering after abortion? all walks of life. *Names changed for privacy. 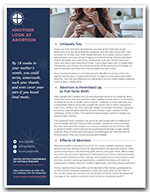 What to Do When a Friend is Considering Abortion – If a friend told you that she was pregnant and considering abortion, would you know what to do? Learn concrete tips for loving her is a way that is life-affirming for both her and her child. How to Build a Culture of Life – In these challenging times, when respect for life is so often disregarded, how do we build a culture that cherishes all human life? The answer goes back to our identity and call as Christians. 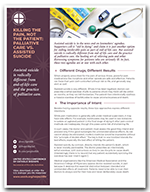 Top Reasons to Oppose Assisted Suicide – Polls indicate the public is receptive to the general concept of assisted suicide. However, when people understand the associated dangers, they are less likely to support the practice. 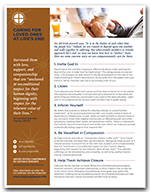 Learn compelling reasons you can share for opposing assisted suicide. Catholic Considerations for Our Earthly Passing – As Catholics, we know that death is the door through which we must pass to gain eternal life. Several considerations are provided as starting points for understanding and preparing for our earthly passing in a way that respects God’s gift of human life. Death Penalty: Catholic Q & A – What does the Church say about the death penalty? It is a pro-life topic? This brochure explores the issue of the death penalty within the context of respect for God’s gift of human life. Understanding Conscience – This brief introduction to conscience addresses what it is, why it is important, and how to form our consciences so they lead us into deeper relationship with God and one another.